(North East PA July 10, 2018) – Mike Morgan's Mackvader has been a little under the weather this season, but fans saw a vintage ‘88Mike' performance at Lake Erie Speedway Saturday. Morgan (#88) held off Bandit Big Rig Series points leader Ricky Rude (#14) to take the checkered flag, putting some of Mackvader's engine issues behind him. "The last ten laps I was holding my breath, because we knew Ricky was coming," Morgan said. "We're still trying to work on things to get Mackvader better, but man, it did really well tonight!" "If I had about three more laps, ol' Mackvader would have been second or third," Rude said. "Me and Mike are good friends and he's a great driver who deserves the win." Morgan wore his son's lucky hat during the race, since his wife and son couldn't attend the event. "Everyone who's been involved with the race series over the years has signed this hat," Morgan said. "He calls it his lucky hat, so I wore it tonight." Morgan even knows what he's doing with the $10,000 check. "Yeah, we're getting new tires on the truck now," Morgan said, laughing. The Boyer RV Bandit Shoot Out nearly saw history, as Scott Treadway (#4) tossed up 12 consecutive wins before Rude bested him in the finals. No Bandit has ever run the table in the Shoot Out, but Treadway's 12 straight wins is a new record. "That was very impressive," Bandit Race Director Brian Madsen said. "Treadway had that high line working and he used it to his advantage." The Bandits head to Salem Speedway in Indiana this weekend, where things will get interesting thanks to Salem's 33 degree banking, which is only three degrees less than Bristol Motor Speedway. "We're going from a fairly flat, three-eighths mile track to a high-banked, 33-degree, half-mile track," Madsen said. "We're usually running tracks that have 15-18 degree banks, so we'll find out which Bandits really love high speeds come Saturday!" The Fan Series Truck Show will take place prior to the Salem event and Minimizer will be giving away one of their Long Haul Series Truck Seats. Mercer Transportation will also be there looking for truck drivers. 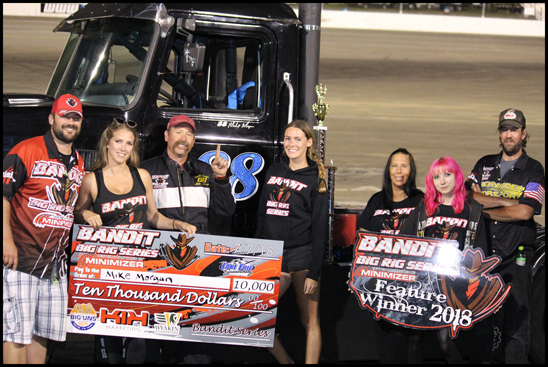 "We're looking forward to back-to-back events," Bandit General Manager Jason Johnson said. "We've had some down time and our fans need their Bandit fix." Tickets for the event at Salem Speedway are available for online purchase by clicking here. "I can't wait to get to the Hoosier State and make our Bandit debut in Indiana," Johnson said.